The article describes the steps involved in the creative process of Surfboard through an interview with João Kouyoumdjian. Available in portuguese (original) and english. Born in Rio Preto (state of São Paulo, Brazil) and currently residing in New York, João Kouyoumdjian produced the CD between Greece and USA; the artwork was elaborated in Armenia, homeland of his family. Born in Rio Preto and settled in New York, João Kouyoumdjian has proven his talent on stages of major concert halls around the world, such as Carnegie Hall. Now, he releases his first CD, "Surfboard" (Pomegranate Music), with 15 tracks wandering between classical and popular music. "This debut recording in the music industry is important because it validates my work as a serious musician and singular artist. Every angle of it - from photos and text to the sonority itself - was thought to reflect my artistic potential" he says. After a year of production in four continents, it is no exaggeration to say that the solo album reaches its goal with praise. The recording was made in January , in Greece, in the studio of guitarist Iakovos Kolanian - built to only record classical guitar, with ideal conditions for any artist in the field. The disk duplication occurred in the United States and the creation of the graphic design was done by Arsineh Valladian, in Armenia - the land of the paternal grandparents of Kouyoumdjian. Incidentally, the visual identity is an attraction in itself. The album is accompanied by detailed liner notes written by the artist that digress about each work and composer. The photos were taken in Rio de Janeiro and São Paulo last August by Gilberto Tadday, who is the same photographer that collaborates with the weekly Brazilian magazine "Veja". During that time, the musician took advantage of the trip to Brazil to perform twice in Rio Preto. One of those performances included a surprise encore, side by side with his first guitar teacher, Preto Moreno. Currently, João Kouyoumdjian maintains a consistent schedule of concerts in New York and New Jersey, as well as touring abroad as a soloist, chamber music performer and as a soloist with orchestras. With "Surfboard" in his hands, João intends to play in Hollywood, San Francisco and Paris, and maybe return to Armenia. Besides, he plans to record a second album through the same label. "For every great artist, the quest for perfection is a constant and will have no end. Not the perfection that others see, but the one that only exists in the artist's soul." Diário da Região - How did the partnership with the label started (Pomegranate Music)? João Kouyoumdjian - After my third concert at Carnegie Hall, "Brazilian Guitar: Tradition and Tendencies", in November of 2011, Raffi Meneshian, the owner of Pomegranate Music, reached out to me and demonstrated interest in learning a little bit more about my work. After many exchanges of messages and phone calls, he offered me the opportunity not only to sign a contract for the release of two CDs until 2015 but also to work as my manager. He usually refuses almost all artists who reach out to him with work proposal, but in my case, the invitation came from him, which further increases the honor. Meneshian was impressed with my ability to singlehandedly produce a concert at Carnegie Hall, on top of being the actual performer. Diário da Região - Will you release the album in Brazil? Kouyoumdjian - Besides the fact that I am a Brazilian artist, the CD is also entirely dedicated to Brazilian music. So, reaching the Brazilian market is a primary goal in the near future. The CD should be avalible in national plataforms soon. For now, you can purchase it at Amazon, iTunes and CD Baby, as an imported product. Diário da Região - Why did you entitled the CD "Surfboard"? Kouyoumdjian - The title comes from the first track, also named "Surfboard". It is an instrumental work by Tom Jobim, inspired by the process of formation and breakdown of waves in California. The melody reflects precisely what he observed: a smooth and continuous cycle of tension and resolution. Fortunately, we had perfect photos that married immediately with that title: pictures with the famous wave patterns of the Copacabana sidewalk, which I found in upright position in a wall of a gas station in Rio. One of those pictures became the albums'. Diário da Região - What do you intend with the chosen repertoire? Kouyoumdjian - The concept of the album is to draw a partial picture of what is Brazilian guitar. The album leans clearly towards urban musical genres originated from Rio, such as Samba, Choro and Bossa Nova. In addition to Villa-Lobos and Tom Jobim, other composers have approached those genres - many of which prolific guitarists such as Garoto and João Pernambuco. I also wanted to present new works by the contemporary Brazilian composers Raimundo Penaforte and Ricardo Calderoni, premiered by me for the first time at Carnegie Hall in 2011. It is a great joy and honor to record these works and actively participate of the future of Brazilian guitar. Finally, the album includes a wonderful arrangement of "Beatriz", by Chico Buarque and Edu Lobo, elaborated by the exceptional Brazilian guitarist Marco Pereira and also presents a new arrangement of "Sons de Carrilhões", by João Pernambuco, elaborated by the living legend of the Brazilian guitar, Carlos Barbosa-Lima. Diário da Região - Why works by Heitor Villa-Lobos are recurrent in your career? Kouyoumdjian - Because they have a special meaning for me. For more than a decade I have been practicing and studying his works and each time I do I refine my interpretation. The "Prelude No. 5", for example, is a piece that accompanied me in competitive auditions to USP and Juilliard, besides memorable performances at Carnegie Hall, Kennedy Center and others. Fortunately, the evaluation of the most experienced critics recognizes this in-deepth work of scrutinizing every little note and they get impressed at the results I achieve. Somehow, I feel that these pieces are mine. Diário da Região - Are there any concerts scheduled for this year in Brazil? Kouyoumdjian - Yes. The Brazilian CD release concert will be at Centro de Cultura Judaica, in São Paulo, on June 13, as part of Movimento Violão guitar series. Concerts in Rio Preto and other locations are still being scheduled. Rio-pretense radicado em Nova York, João Kouyoumdjian produziu o disco entre Grécia e EUA Nascido em Rio Preto e radicado em Nova York, o violonista João Kouyoumdjian já provou seu talento nos palcos de importantes casas de espetáculos pelo mundo, como o Carnegie Hall. Agora, ele lança seu primeiro CD, “Surfboard” (Pomegranate Music), com 15 faixas que passeiam pelo erudito e o popular. “Essa estreia na indústria fonográfica é marcante por validar meu trabalho como músico sério e artista diferenciado. Cada ângulo - desde as fotos e texto de encarte até a sonoridade - foi pensado minucioasamente para refletir todo meu potencial artístico”, diz ele. Após um ano de produção em quatro continentes, não é exagero dizer que o álbum solo alcança seu objetivo com louvor. A gravação foi feita em janeiro, na Grécia, mais especificamente no estúdio do violonista Iakovos Kolanian - montado só para gravar violão clássico, com condicões ideais para qualquer artista de ponta. A prensagem e duplicação do disco ocorreram nos Estados Unidos. Já a criação da arte gráfica foi realizada por Arsineh Valladian, na Armênia - terra dos avós paternos de Kouyoumdjian. Aliás, a identidade visual é uma atração à parte. Cada canção é acompanhada por notas do artista, que falam sobre a obra e o compositor. Os ensaios fotográficos foram feitos no Rio de Janeiro e em São Paulo por Gilberto Tadday, colaborador da “Veja”, em agosto do ano passado. Na época, o músico aproveitou a viagem para duas apresentações na cidade natal, incluindo bis-supresa ao lado de seu primeiro professor de violão, Preto Moreno. Atualmente, ele mantém agenda consistente de concertos nas regiões de Nova York e Nova Jersey, além de excursionar pelo exterior como solista e camerista em orquestras. Diário da Região - Como surgiu a parceria com a gravadora (Pomegranate)? 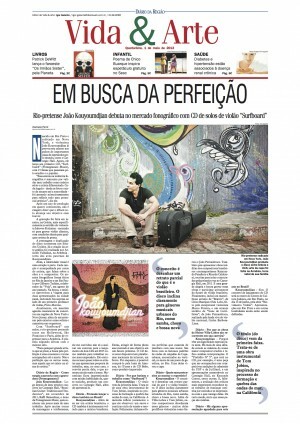 João Kouyoumdjian - Logo depois de meu terceiro concerto no Carnegie Hall, “Brazilian Guitar: Tradition and Tendencies”, em novembro de 2011, Raffi Meneshian, o dono da Pomegranate Music, quis conhecer um pouco mais do meu trabalho. Após muitas trocas de mensagens e telefonemas, ele me convidou não só a assinar um contrato para o lançamento de dois CDs até 2015 como também para trabalhar como meu empresário. Ele costuma recusar quase todos os artistas que apresentam proposta de trabalho, mas, no meu caso, o convite partiu dele, o que aumenta ainda mais a honra. Meneshian ficou impressionado com minha habilidade de, quase sozinho, produzir um concerto no Carnegie Hall, além de apresentá-lo. Diário - Pretende lançar o disco também no Brasil? Kouyoumdjian - Além de eu ser um artista brasileiro, o CD também é inteiramente voltado para a música brasileira. Então, atingir de forma plena esse mercado é um objetivo em um futuro próximo. O CD deve estar disponível em plataformas nacionais da internet, em breve. Por enquanto, é possível comprá-lo pela lojas da Amazon, do iTunes e do CD Baby, como produto importado. Diário - Por que batizou o trabalho como “Surfboard”? Kouyoumdjian- O título vem da primeira faixa. Trata-se de uma obra instrumental de Tom Jobim, inspirada no processo de formação e quebra das ondas do mar, na Califórnia. A melodia reflete justamente o que ele observou: um suave e contínuo ciclo de tensão e resolução. Felizmente, tínhamos fotos perfeitas que casaram de imediato com esse nome. São fotos com os famosos padrões de ondas do calçadão de Copacabana, encontrados na vertical, no muro de um posto de gasolina, no Rio. Uma delas virou a capa. Diário - Quais suas pretensões ao montar o repertório? Kouyoumdjian - O conceito é desenhar um retrato parcial do que é o violão brasileiro. O disco inclina claramente para gêneros musicais urbanos oriundos do Rio, como samba, choro e bossa nova. Além de Villa-Lobos e Tom Jobim, outros compositores abordaram esses gêneros - muitos deles prolíficos violonistas como Garoto e João Pernambuco. Também quis apresentar obras inéditas dos compositores brasileiros contemporâneos Raimundo Penaforte e Ricardo Calderoni, escritas para mim e executadas pela primeira vez no Carnegie Hall, em 2011. É uma grande alegria e honra gravar essas obras e participar ativamente do futuro do violão brasileiro. Finalmente, inclui um maravilhoso arranjo de “Beatriz”, de Chico Buarque e Edu Lobo, feito pelo excepcional violonista Marco Pereira, e um arranjo inédito de “Sons de Carrilhões”, de João Pernambuco, realizado pela lenda viva do violão nacional, Carlos Barbosa-Lima. Diário - Por que as obras de Heitor Villa-Lobos são recorrentes em sua carreira? Kouyoumdjian - Porque têm um significado especial para mim. Há mais de uma década estudo as músicas do nosso maior compositor erudito e refino minhas interpretações. O “Prelúdio Nº 5”, que está no CD, por exemplo, é uma peça que me acompanhou nas competitivas audições de admissão da USP e da Juilliard, e em apresentações memoráveis no Carnegie Hall, no Kennedy Center, entre outras. E, felizmente, a avaliação dos críticos mais experientes reconhece esse trabalho de esmiuçar notinha por notinha e se impressiona com o que consigo delas. De certo modo, sinto que essas peças são minhas. Diário- Há alguma apresentação agendada para este ano no Brasil? Kouyoumdjian - Sim. O concerto de lançamento do CD será no teatro do Centro de Cultura Judaica, em São Paulo, no dia 13 de junho, pela série “Movimento Violão”. Apresentações em Rio Preto e em outras localidades ainda estão sendo definidas.